Ordinary Magic by Caitlen Rubino-Bradway. Bloomsbury, 2012. Currently Available. Face Value: Standard. This cover is totally unexceptional. It looks like it could be almost any generic middle grade fantasy to come out in the past five years. From the color palate to the trees to the mysterious castle in the background and the girl at the center, nothing about this cover strikes me as particularly unique. That said, nothing about this cover is all that bad either. It’s not memorable, but having read the book, it’s also more or less accurate and not unpleasant to look at. But there’s nothing to distinguish it on the shelf, so you’re going to have to take my recommendation that the book itself is much better than average. Does it Break the Slate? Yes! Delightfully so. First, the obvious – Abby is a great protagonist. She’s brave but also believable, and a loyal friend and a goodhearted person. But also, the world that Caitlen Rubino-Bradway has created here is decidedly not one where gender precludes power. The most powerful character we encounter is Abby’s older sister Alexa. We interact with a number of women in respected, powerful roles, and it doesn’t seem to be a major part of the story’s conflict. Instead, the major power struggle in this book is, interestingly, skill based – the more magical power you have, the “better” you are, regardless of anything else. However, these skills are not earned – they are something you either have or you don’t. So it still creates its own class system based on whether or not you have magic. It’s interesting to see these power dynamics play themselves out in this particular fictitious world. Who would we give it to? Easy sell. Middle grade readers who are into Harry Potter and The Lightning Thief but aren’t quite ready for The Hunger Games will be all over this. It reads young – it won’t have much crossover into older middle school, but that’s not necessarily a bad thing. I love finding decidedly middle grade novels, that third, fourth and fifth graders will be all over, and that are meant for them. Review: Abby Hale lives in a world where magic is the norm. As soon as they turn 12, children are tested for their latent magical abilities, and placed into schools and careers accordingly. Abby is expected to do well – her family is full of talented magicians. Many of her siblings scored in the impressive 5-6 range and her older sister Alexa scored a 9 – basically unheard of. But Abby fails the test. She is an “ord” – a non-magical person who will be basically shunned by the whole community. Many ords are sold to adventurers, mistreated and forced into early deaths. But Abby is lucky. Her family stands by her, and Alexa gets her a spot into a special school for ords. There she learns all kinds of non-magical skills, plus how to defend herself when faced with magic. In some ways, we could see this as sort of a reverse Harry Potter. Instead of being whisked away from a life of miserable normal-ness to discover a whole new world and magical abilities, Abby has all of that magic drop out from under her to discover she is ordinary. And in many ways, Abby and her friends are in a lot more danger, and have to step up their game a lot more than the Hogwarts crew. After Abby discovers she’s an Ord, many of their friends and neighbors stop speaking to the family. When she tries to go to school, she’s asked to leave. And there are plenty of dangerous people out there who want to mistreat or take advantage of her. So when we see Abby and her classmates learning self-defense at their new school, it takes on a whole new level of urgency. They aren’t presented as weak, just different – and because of that they have to learn different ways to protect themselves. I adored Abby’s character voice, and found her to be a totally wonderful heroine – equal parts brave and uncertain. And the relationships developed with her friends at the school are dynamic and interesting (though I hope we’ll see Fran develop a bit more of a backbone in the next installments) And her family is just as wonderful. Not to once again compare to Harry et al, but I loved everything about the Hale family and their unflagging support of Abby no matter what, and its nice to see a protagonist in a fantasy novel with this kind of support behind her. The book isn’t perfect. It’s challenging to create a complete alternate universe, and the “rules” of the magic haven’t totally solidified. For example, we know that kids don’t do any magic until they’re judged at age 12. But after it turns out Abby is an Ord, they have to make all kinds of accommodations, draining the magic out of her room, unhexing doors – but wouldn’t that have been a problem before? How do kids under 12 function if nobody uses magic? It’s a fascinating new world, and really well-rendered for the most part. But I think it needs a little more clarification, which will hopefully happen in the next books. And honestly – I just really liked it. It’s a fun read. I liked the characters. I cared about what happened to them. At its heart, Ordinary Magic is an inspired, charming middle grade fantasy that kids are going to really like. I, for one, can’t wait for the sequels. This entry was posted in Middle Grade, Reviews and tagged Boarding School, Family, Fantasy, Magic. Bookmark the permalink. 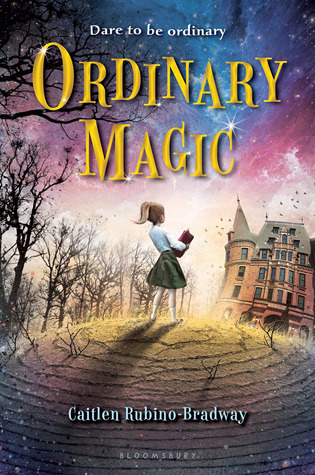 I guess it is because of what happened over the weekend that i have been thinking about Ordinary Magic again (i read it when it first came out). The story is great but the subtle parable about prejudice and kids who are marginalized or different hit home. What happens to these kids when they are not lucky enough to have a family and big sister (yeah – I loved Alexa too!) like Abby has? Do they just turn inward and get more and more unconnected to humanity? Anyway i liked Abby a lot. I did too! If there is I hope Trixie and Mike come back!